TV with Thinus: REVIEW. E! 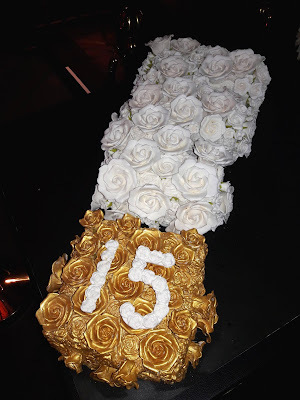 's 15th birthday party in South Africa was fine and looked beautiful, but with too many 'standing-room only' guests while TV execs hid away in their roped-off alcoves, it felt more 'college-years nightclub night' than big celebration. REVIEW. E! 's 15th birthday party in South Africa was fine and looked beautiful, but with too many 'standing-room only' guests while TV execs hid away in their roped-off alcoves, it felt more 'college-years nightclub night' than big celebration. 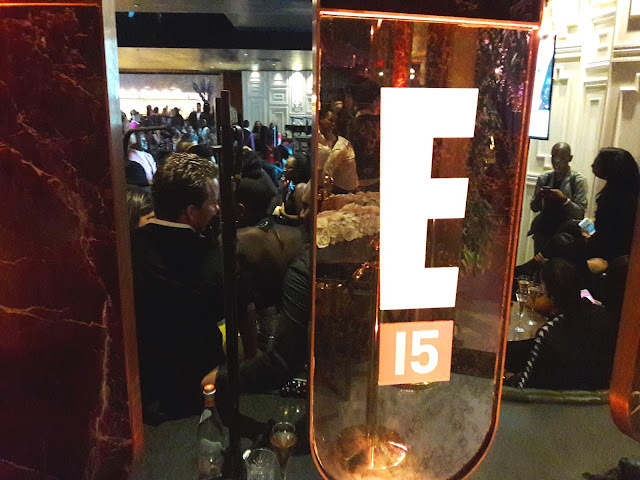 The 15th birthday party Thursday night of E! Entertainment (DStv 124) that was held at the retro-styled, avant-garde nightclub-restaurant Alice & Fifth in Sandton was fine but not exclusive enough, filled with too many people not interested in or knowledgeable about E! at all, with standing-room only for the majority of well-heeled guests if they were not MultiChoice or NBCUniversal International Networks executives. To mark its presence of a decade and a half since December 2004 on MultiChoice's DStv satellite pay-TV service, NBCUniversal International Networks (NBCUIN) United Kingdom division also responsible for Africa as an emerging market, organised a 15th anniversary red carpet media event and celebration that took place on Thursday. It was attended by a team from NBCUniversal International Networks who flew in to South Africa for the event, MultiChoice representatives, local stars like Bonang Matheba, Minnie Dlamini, local E! on-screen talent like Kat Sinivasan and Roxy Burger and Nigeria's D'banj rapper who all appear in E! 's latest TV commercial as part of its new Africa marketing campaign; as well as advertising executives, ad buyers and sponsors, TV producers, press and socialites. The new venue was great but either NBCU and E! invited too many people, or the venue was too small. It made the average event fine but far from great due to feeling cramped. It was very difficult to walk with a very long waiting time at both of the two open bar areas and difficult to get any of the food on the platters circulating, making the occasion more "college-years nightclub night out" in vibe and feel that 15th anniversary celebration. It was a shoulder-to-shoulder push-through crowd for the entire night for the majority of guests unless you were one of the VIP celebrities, or MultiChoice or NBCUIN executives and representatives, who were ensconced in their security guard roped-off alcoves in the main restaurant area. They apparently had access to another restricted VIP area as well with good food, further back inside the adjacent La Luna, away from the crowd. There didn't seem to be enough glasses. I didn't eat anything and only had a glass of Bonang Matheba's new House of BNG Methode Cap Classique (MCC) sparkling wine and nothing else. 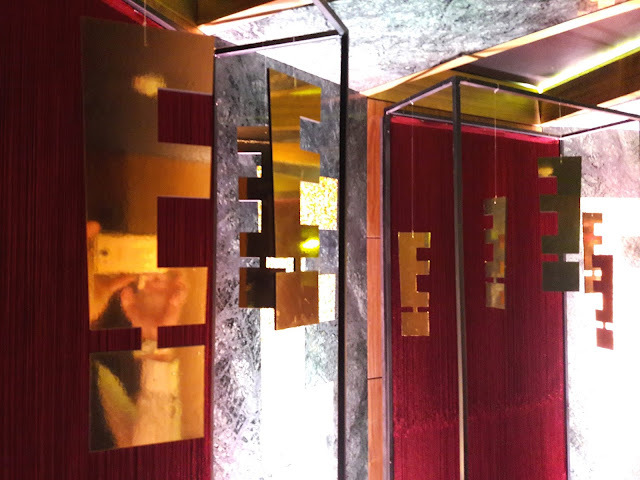 The party had a beautiful selfie booth with centre couches and gold-and-floral themed walls. Sadly there was no access control here. Some guest obsessed with selfies would hog the time and physical space and not move on, causing excruciating waits for other people who also wanted to snap pics. How many photos of yourself is enough? A TV screen showed selected rolling social media messages and photos in real time from guests at the E! event and was smartly in-theme with the event and what E! does. The celebration event had a beautiful flower installation at the main entrance although it was a bit too dark for people to properly appreciate it. There was also a beautiful gold-and-white "15"-adorned cake just inside of the entrance. Halfway through the night the cake disappeared, leaving a black table and a rope line around it with nothing on/inside it. Once again as in the past and not unique to E! (and not the organisers fault although it still detracted from the atmosphere and evening) liquored-up guests couldn't care less for the proceedings or the real reason for the party. They loudly and crassly continuing to cackle and talk during the short formal presentation and speeches part of the night, with no sense of decorum or how to behave at an event like this. Several times NBCU reps and other people involved in the event and in the crowd during the speeches said "shhhhhh" to try and get the crowd to quiet down but to no avail. The music was too loud (am I old?) making it awkward to make small talk or really engaging in any audible conversation. There were no highlights package looking back at 15 years, or anything besides two speeches and the new promo. A 15th anniversary like this needs and feels like it deserves a little bit more in terms of a formal presentation. The gold, black and pink décor, flower arrangements and E! signage were all great and well-done. Had I organised this I would have gone for a more exclusive gathering and a more exclusive guest-list with people who have walked somewhat of a journey in whatever aspect with E! over a number of years already - not the flavour-of-the-moment Laziswe's and starstruck Pinkygirl's of the world. It would have allowed not just all guests to breathe but actually, the stunning venue to breathe and be appreciated as well. E! 's 15th birthday celebration was fine, it was just too full, and filled with some people for whom it's just another night's party and who shouldn't have been allowed in. Congratulations to E! on 15 years on television in South Africa and Africa.